PanAsia Surgery Group/News & Articles/Are Nightly Toilet Trips Normal? Are Nightly Toilet Trips Normal? Ask the expert by Epoch Times. 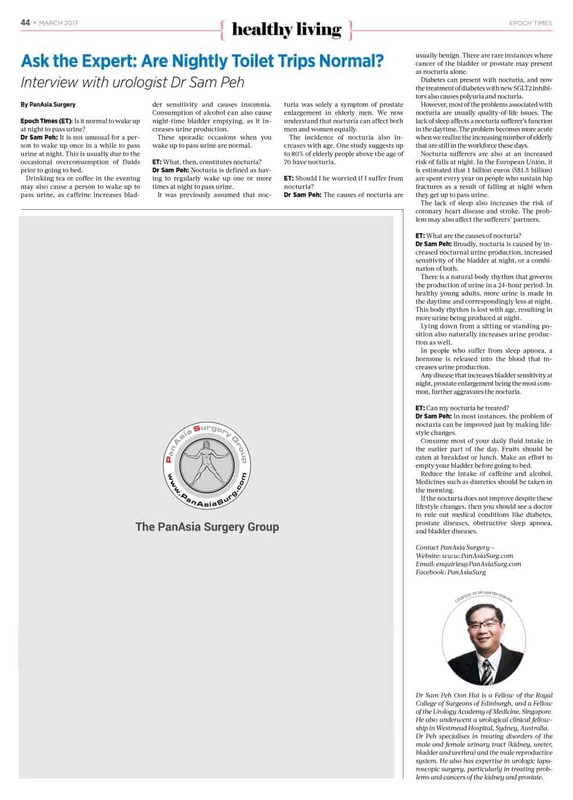 a recent interview with PanAsia Surgery Urologist, Dr Sam peh. Epoch Times (ET) : Is it normal to wake up at night to pass urine? Dr Sam Peh: It is not unusual for a person to wake up once in a while to pass urine at night. This is usually due to the occasional overconsumption of fluids prior to going to bed. Drinking tea or coffee in the evening may also cause a person to wake up to pass urine, as caffeine increases bladder sensitivity and causes insomnia. Consumption of alcohol can also cause night-time bladder emptying, as it increases urine production. These sporadic occasions when you wake up to pass urine are normal. ET: What, then, constitutes nocturia? Dr Sam Peh: Nocturia is defined as having to regularly wake up one or more times at night to pass urine. It was previously assumed that nocturia was solely a symptom of prostate enlargement in elderly men. We now understand that nocturia can affect both men and women equally. The incidence of nocturia also increases with age. One study suggests up to 80% elderly people above the age of 70 have nocturia. ET: Should I be worried if I suffer from nocturia? Dr Sam Peh: The causes of nocturia are usually benign. There are rare instances where cancer of the bladder or prostate may present as nocturia alone. Diabetes can present with nocturia, and now the treatment ofdiabetes with new SGLT2 inhibitors also causes polyuria and nocturia. However, most of the problems associated with nocturia are usually quality-of-life issues. The lack of sleep affects a nocturia sufferer’s function in the daytime. The problem becomes more acute when we realize the increasing number of elderly that are still in the workforce these days. Nocturia sufferers are also at an increased risk of falls at night. In the European Union, it is estimated that 1 billion euros (SS1.5 billion) are spent every year on people who sustain hip fractures as a result of falling at night when they get up to pass urine. The lack of sleep also increases the risk of coronary heart disease and stroke. The problem may also affect the sufferers’ partners. ET: What are the causes of nocturia? Dr Sam Peh: Broadly, nocturia is caused by increased nocturnal urine production, increased sensitivity of the bladder at night, or a combination of both. There is a natural body rhythm that governs the production of urine in a 24-hour period. In healthy young adults, more urine is made in the daytime and correspondingly less at night. This body rhythm is lost with age, resulting in more urine being produced at night. Lying down from a sitting or standing position also naturally increases urine production as well. In people who suffer from sleep apnoea, a hormone is released into the blood that increases urine production. Any disease that increases bladder sensitivity at night, prostate enlargement being the most common, further aggravates the nocturia. ET: Can my nocturia be treated? Dr Sam Peh: In most instances, the problem of nocturia can be improved just by making lifestyle changes. Consume most of your daily fluid intake in the earlier part of the day. Fruits should be eaten at breakfast or lunch. Make an effort to empty your bladder before going to bed. Reduce the intake of caffeine and alcohol. Medicines such as diuretics should be taken in the morning. If the nocturia does not improve despite these lifestyle changes, then you should see a doctor to rule out medical conditions like diabetes, prostate diseases, obstructive sleep apnoea, and bladder diseases. Make an appointment to talk to our Urologist – Dr. Sam Peh in person.